Our activities are organized around various strategies connected to tissue repair and tissue engineering. The UMR 977 was created by INSERM in January 2009 after positive evaluation of two teams (A+) by the AERES, the BmIT-1 team “Active Biomaterials and Tissue Engineering” managed by Dr Nadia Benkirane-Jessel, and another team, BmIT-2. In 2013, for the renewal of our unit, we have proposed a new project based on the BmIT-1 team “Active Biomaterials and Tissue Engineering”. We have proposed also a new name “Osteoarticular and Dental Regenerative Nanomedicine”, which reflects our scientific development in the field of smart hybrid materials and regenerative nanomedicine. They concern domains such as tooth engineering, bone repair, bone metastasis and cartilage regeneration. In January 2018, V. Schini-Kerth, UMR CNRS 7213, Faculty of Pharmacy, University of Strasbourg, head of team “Experimental and Therapeutic Pharmacology” and L. Kessler (EA 7293) head of team “Vascular and tissular stress in transplantation” joined us for a promising project targeting vascular protection in health and diseases. 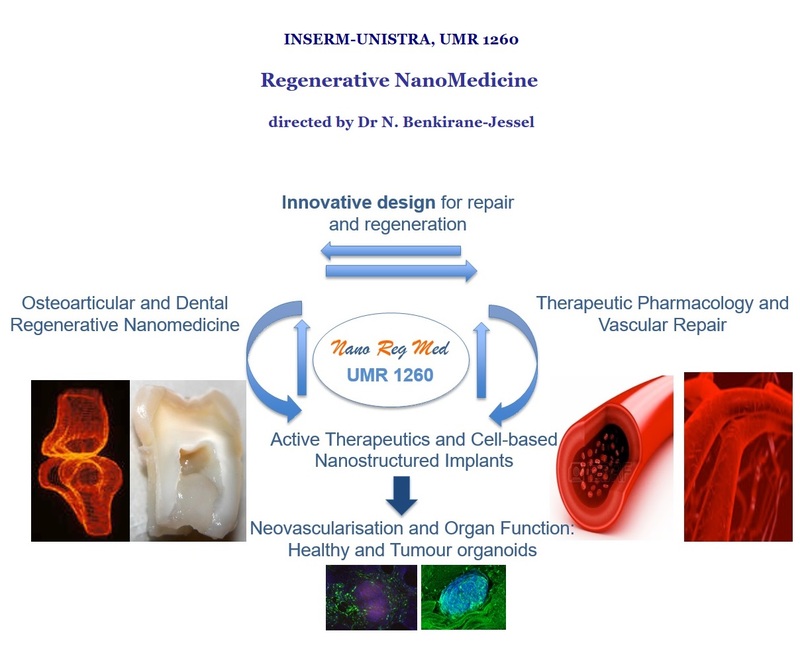 The UMR 1260 INSERM-UNISTRA, created in January 2018 under the direction of N. Benkirane-Jessel, is based on one team “Monoéquipe” entitled “Regenerative Nanomedicine”. 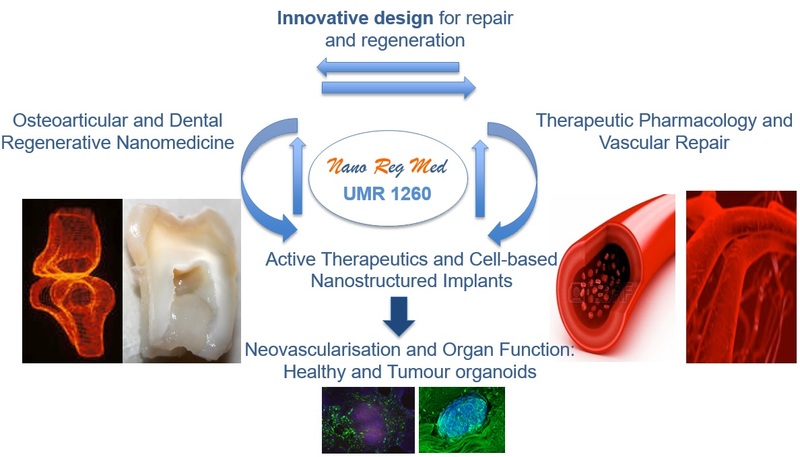 Our UMR 1260 is based on 2 themes: “Osteoarticular and Dental Regenerative Nanomedicine” theme, headed by N. Benkirane-Jessel and “Therapeutic Pharmacology and Vascular Regeneration” theme, headed by V. Schini-Kerth. 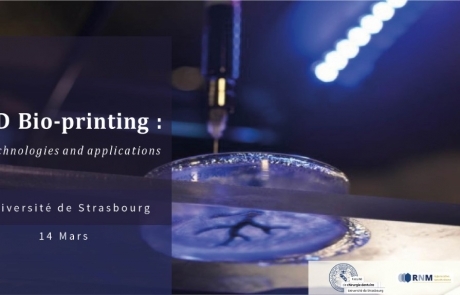 These two themes will work together and focus on the 3 programs validated by the INSERM and our University ” Université de Strasbourg”. Our Unit affiliation (UMR 1260) is INSERM and University of Strasbourg.